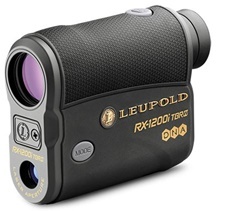 The Leupold RX-1200i TBR/W with DNA is a new addition to Leupold’s popular RX hunting laser rangefinder line; most noteworthy of this edition is its ability to aid the shooter in accounting for wind. This is now Leupold's premier rangefinder and comes with more bells and whistles than almost any other rangefinder on the market. So did Leupold create an awesome hunting rangefinder or an overly complex unit to avoid? This new Leupold rangefinder can trace its core features back to the RX-1000i TBR, which was one of Leupold’s first high end rangefinders; this original model has been updated almost yearly until it has reached its present form, the RX-1200i TBR/W DNA. The RX-1200i indicates the unit’s purpose (RX=hunting, GX=golf) and the 1200 means a maximum range of 1200 yards, while the TBR (True Ballistic Range) conveys the unit is capable of angle compensated readings. Meanwhile, the “W” indicates the new wind adjustment feature while DNA (Digitally eNhanced Accuracy) signifies a processor upgrade the line went through several years ago that improved speed and accuracy of the units. Currently, Leupold makes a plain line of sight rangefinder called the RX-1200i DNA, and last year’s RX-1200i TBR DNA without the windage feature is still widely available so pay close attention when shopping. A slim and compact vertical style rangefinder, the RX-1200i TBR/W DNA has an aluminum housing equipped with a rubberized layer for a better grip and is rated as weatherproof . It has a 6x magnification making the device suitable for both bowhunting and rifle hunting, and has a last target priority mode to aid in ranging through cover like tall grass or branches. This Leupold rangefinder uses a red OLED display which provides a clearer sight picture than older style LCD display screens, and it is capable of displaying both true horizontal range or holdover adjustments in Mil, MOA, inches, or cm while in rifle mode. Speaking of modes, this unit has three: LOS (line of sight), Bow, or Rifle. LOS is a simple mode that returns ranges without the angle of the shot being taken into account; the rifle and bow modes are described in detail below. Finally, the Leupold RX-1200i TBR/W DNA is rated as having maximum distance of 1200 yards on highly reflective targets, 900 yards on trees, and 800 yards on deer; and is equipped with full value wind calculations but does not actually measure wind speed. The Rifle Mode of the RX-1200i TBR/W has a number of available options. First is a BAS which simply outputs the true horizontal distance to the target. Next is a HOLD which displays the amount of holdover to the target; this measurement will be in inches if the unit is set to measure in yards, or cm if the unit is set to measure in meters. The MIL option shows the amount of holdover in milliradians, while the MOA selection displays the holdover info in minutes of angle. Note this rangefinder limits holdover calculations to 800 yards. Finally, the TRIG setting is unique in that it reports both the true horizontal and vertical range to the target and is useful for measuring the height of objects. While in Rifle mode, there are twenty five different ballistic groups to choose from when selecting a cartridge/load for those who wish to utilize the RX-1200i TBR/W’s holdover info. The manual comes with numerous popular loads and their corresponding group number. The manual also contains each groups hold over range and wind drift parameters at 600 yards; this enables you to choose what group to use should you be shooting a wildcat or uncommon caliber not listed in the popular loads table. You might need to plug your data into a ballistic calculator or program to get the required drop data at 600 yards if you are shooting one of these wildcats or uncommon rounds. Note a ballistic group must be selected to get wind hold values as the unit needs to have a bullet and velocity to work with when determining how much wind drift there will be at any given distance. The RX-1200i TBR/W does not measure wind so the shooter will still need to measure or judge the wind conditions; however, once a ballistic group is selected this rangefinder is capable of calculating full value wind holds at the ranged distances. Full value wind is 10 mph and measured at a 90 degree angle to the shooter; this value is an easy number to work with. For example, if you have a 5 mph wind you simply divide the full value (10mph) hold info by 2; conversely if wind is 20 mph you can calculate by multiplying the full value (10mph) hold by 2. With a little practice making adjustment in 5 mph increments in your head on the fly becomes pretty easy. Also, this method doesn’t require the shooter to input the current wind value into the unit after ranging which saves time when getting ready for a shot. Finally, like the elevation corrections, these windage corrections are also calculated out to 800 yards. When the RX-1200i TBR/W is in Bow mode it provides angle compensated distances out to 125 yards. While in Bow mode if you target anything that is beyond 125 yards the rangefinder will report the line of sight measurement and flash a “LOS” icon to let you know the angle is not being compensated for. However, this shouldn’t be an issue as most archery shots, and even those with crossbows are generally much closer. Being able to give full value windage holds isn’t the only unique feature of the Leupold RX-1200i TBR/W; this unit also has a selectable reticle with three different options to choose from. Reticle options include a small crosshair, a large crosshair, and a large crosshair with open center; the larger options are more of a personal preference choice for use on big game while the smaller option is better suited for ranging smaller animals and targets. Another unique feature is this unit's ability to measure a height when the Trig setting is selected within the Rifle mode; and while this may not have direct shooting applications when hunting; it could be useful for measuring the height of any object you want to measure or have just always been curious about. The inclusion of a wind adjustment feature is a nice addition to the RX-1200i TBR/W rangefinder. Wind is an important factor to consider when taking a shot, yet nearly all rangefinders have no way to account for wind; furthermore the simple way Leupold tackled this problem makes a lot of sense as it is an easy way to make quick and simple windage calculations. Also, we like that this rangefinder is equipped with 6x magnification, last target priority, and an angle compensation feature which helps it work well for both archery and rifle hunting. Lastly, those who want to use a rangefinder as a binocular substitute will find the unit’s OLED screen clearer than older or budget rangefinders with LCD displays. Note, when rangefinders are off the reticle and display icons do not show up, so the screen is clear of all lit up distractions and can be used like a monocular although do not expect binocular style image quality. With lots of options comes increased complexity; there really isn’t much of a way around that, so setup and adjustments with the RX-1200i TBR/W are more involved than most rangefinders. There are a lot of options and only two buttons to work with when programming so be prepared to spend some time getting things set up and familiar with all the settings. Also, we have never really been a big fan of the separate Bow and Rifle modes, often we will be archery hunting in the morning and coyote hunting with rifles later the same day and back to bowhunting in the evening and don’t want to constantly be switching between modes; although this is a rather minor complaint with this unit as it does still provide line of sight distances past 125 yards even when in bow mode. 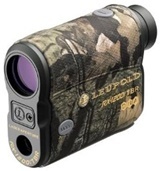 The Leupold RX-1200i TBR/W is one of the most customizable laser rangefinders available. However, all these options come at the expense of more in depth programming; so those looking for a simpler rangefinder that can give them true horizontal distance without all the modes, settings or ballistic calculations would likely be better off with something like the Nikon Prostaff 7i. Also, while this unit is capable of calculating ballistic solutions up to 800 yards, 500 yards in most circumstances is probably a better maximum distance to rely on these ballistic calculations; because around 500 yards factors such as temperature, barometric pressure (elevation), and other variables this rangefinder doesn’t account for start coming more and more into play. A couple things worth noting along those lines. First, 500 yards is a really long ways and it takes a lot of skill to confidently make an ethical shot on a live animal in field conditions at that range. Second, those sure they need a rangefinder that can calculate ballistic solutions out to say 1000 yards are basically look looking at something like the Gunwerks G7 BR2 which currently sells for around $1800. ​The Leupold RX-1200i TBR/W with DNA does a lot right, it uses higher end components like an aluminum housing and red OLED display; and has desirable features like angle compensation, and Last Target priority which make it well suited for archery and rifle hunting. Furthermore, it can calculate full value wind corrections and also provides more options and customization than any other rangefinder in its class. We feel this rangefinder could handle most hunting applications quite well, but is probably best suited for those not afraid to dig into the menu/settings options and make full use of the technologies and customization this rangefinder offers. Currently the RX-1200i TBR/W DNA is going for around $400 and camo versions are currently selling for about $20 more. 3.8" x 1.3" x 2.9"